I also love to do still-life art. I did not have to go very far to get the main ingredients of this image. It consists of objects gathered over the years sitting on a shelf in my study: carvings of Santos from Spain, a Chinese dragon candlestick holder, a paper-mache peasant from Bolivia, a carved Aztec mask from central Mexico, tiny black stone day-of-the-dead skeletons and turtles from a tiny village near Oaxaca. All are sitting on a carved teak shelf from Brazil. 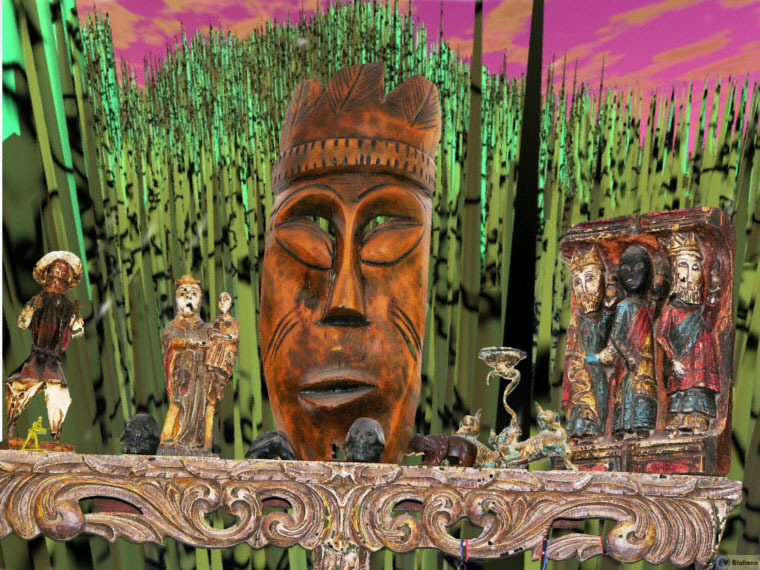 The forest of green spiked plants in the background is a fractal creation I designed to complement the objects. As I write this I can turn my head and see the same scene on my wall, minus the green spiked plants that is.